CINCINNATI — UC great Kenyon Martin, a former National College Player of the Year and No. 1 NBA draft choice, quickly took a stand against the hiring of John Brannen. "I give the University of Cincinnati an F+ for the hiring process," Martin tweeted Sunday after UC announced it had chosen the Northern Kentucky University basketball coach to replace Mick Cronin. By the next day, though, Martin had a change of heart, tweeting congratulations to Brannen and declaring, "I have no problem with you." That goes to show that there are doubters among the UC faithful, and that a coach coming from what recently was a Division II program will have his work cut out for him. Bring it on, Brannen seemed to say in his introductory news conference at Fifth Third Arena Monday morning. The 45-year-old Brannen spoke like a coach with a chip on his shoulder. He started by apologizing to Tiger Woods for stealing his thunder. Imagine that. He was quick to address one of UC fans' major concerns - “So everyone wants to know about style of play, right?" - and promised the ones who didn't care much for Cronin's emphasis on defense that they will like what they see next season. "Our style of play will invigorate the fan base and capture your heart," Brannen said pointedly. With some fans questioning why UC didn't hire a coach with UC connections or one with a national reputation, Brannen and Athletic Director Mike Bohn have found themselves on the spot. Brannen tried to put them at ease, promising to "push the basketball and play fast offensively." "It will be wrapped around 94 feet both ways," Brannen said of his team's new style. "We’ll get out there and we’ll press fullcourt. We’ll attack offensively in transition. Doesn’t mean we’ll take quick shots. We’ll take the first available good shot." He indicated that UC fans will get the best of both styles. "Defensively, we want to wear you out and go deep in the shot clock, which is the traditional Cincinnati defense that wins games," Brannen said. Brannen said his theory is that "chance favors the aggressor," and he applies it on offense as well as defense. As for Bohn, he said the search for Cronin's replacement was exhaustive, but no matter where he looked, the coach working 10 miles across the river stayed at the top of his list. “It’s real similar to a search I did at another institution at one time - people say, ‘Ah, it’s just a local guy,’” Bohn said. “Yeah, he is a local leader and a guy with incredible talent." "No one ever trumped John Brannen, and I think that's what was so impressive,” Bohn said. WATCH the full news conference in the player below. 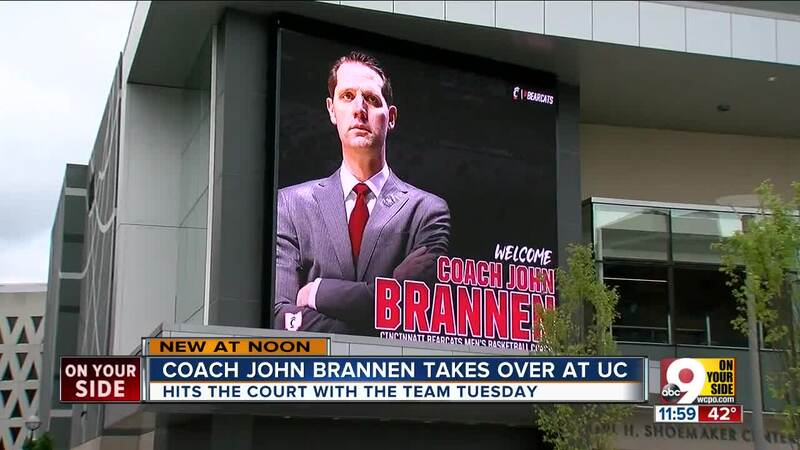 Brannen called coaching at UC "a dream job." The Alexandria, Kentucky, native who put NKU on the college basketball map in his four years there said it's been "an emotional time" transitioning from his first head coaching job, but that he is humbled, honored and energized. 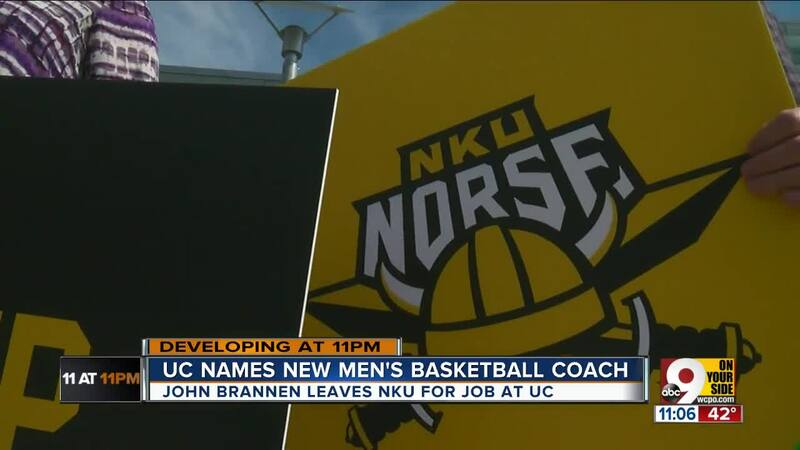 But Brannen and Bohn realize that Brannen faces a much different task than he had at NKU. Brannen had unmatched success in helping NKU make the jump from Division II to active status in Division I. After basically starting from scratch, Brannen led the Norse to two NCAA Tournaments, two Horizon League Tournament and regular-season championships and one NIT appearance in the past three years. At UC, though, he'll be trying to build on the success of a big-name program (that'll be Oscar Robertson sitting behind the bench) - a program that won two NCAA championships in the 1960s, went to six Final Fours, plays a tougher schedule, and has a much larger fan base with much higher expectations. Even though the Bearcats made the NCAA Tournament the past nine years under Cronin, many fans weren't satisfied that Cronin couldn't advance them past the first weekend in the past seven years. That makes winning over the fans as much a priority as winning over the players. In a statement announcing Brannen's hire Sunday, Bohn made the point to say Brannen "coaches an exciting style of basketball," which may or may not have been a shot at Cronin's defensive style. To Bohn's point, NKU ranked 44th in scoring offense last season (78.5 point per game) while UC ranked 198th (71.7). UC was 14th in scoring defense (62.7) while NKU was 106th (68.9). In a head-to-head matchup, UC beat NKU last season, 78-65, on Dec. 4 at UC. When it came to replacing Cronin, some UC fans might have favored one-time UC star Nick Van Exel. Or South Carolina coach Frank Martin, a former Bob Huggins assistant. Or Cronin's associate head coach, Darren Savino. WATCH WCPO Sports Director John Popovich analyze the decision. Van Exel, who played on Huggins' 1992 Final Four team, is now an assistant with the NBA Memphis Grizzlies but has no head coaching experience. Van Exel played for six NBA teams and was an All-Star with the Lakers in 1998. Martin took the Gamecocks to the Final Four in 2017 but said he wouldn't meet with UC out of loyalty to South Carolina and Huggins. When Cronin went to UCLA last week, he endorsed Savino and said Savino would join him on his UCLA staff if UC didn't promote him. So Brannen it is. Like Bohn said, the one-time Newport Central Catholic player has a record that spells success. Brannen's teams were outmanned but competed well against Kentucky and NCAA runner-up Texas Tech in first-round NCAA losses in 2017 and 2019, respectively. That also goes for a loss to Louisville in the 2018 NIT. Brannen comes to UC with major-conference coaching experience after six years as an assistant at Alabama, which earned him the job at NKU. He was associate head coach for two years and the Tide's interim head coach during the 2015 NIT. Brannen earned a reputation as a top recruiter at Alabama and VCU, where he spent three seasons. At UC, he will need to recruit better players to compete at a higher level. Brannen also was assistant coach at St. Bonaventure, Eastern Kentucky and Charleston. Brannen is a big loss for NKU, but it was only a matter of time before a major school snatched him away. “Coach Brannen has been a terrific ambassador for Northern Kentucky University during his four years as our head coach,” said NKU President Ashish Vaidya in a release. “We are grateful for what he has done to build the Norse men’s basketball brand into a premier program in the Horizon League and wish both John and his family well in this next endeavor. Norse men’s basketball is positioned to continue its remarkable success and showcase this great university." NKU said a "national search" to replace Brannen would begin immediately. Brannen becomes the 27th coach in UC history and the first outsider since Huggins. Cronin had head coach for the past 13 years. Brannen should get a sizable raise from the $350,000 he made at NKU last season. UC paid Cronin $2.2 million. As a player, Brannen split his college career between Morehead State and Marshall, where he led the Southern Conference in scoring. A Rhodes Scholar finalist, Brannen received scholarships from both the NCAA and Southern Conference. He played two seasons of pro ball in Belgium’s First Division before beginning his coaching career.